The story of Dr. Redjali, a well known public figure in Iran in the mid-twentieth century, begins in Iran (Persia) during the time of Iran’s westernization and modernization spearheaded by Reza Shah Pahlavi at the beginning of the 20th century and follows the social, historical, political turmoil, and educational events of the past seventy years in Iran, in Europe and the United States. Like a symphony, this book is composed of four movements. Through these movements, the author weaves the notes of her life into melodies of social and historical changes, upheavals, wars, revolutions and peace. She traces her own transition from being part of Iran’s ruling class to her job-seeking struggles in the United States. This provides the reader, through the author’s firsthand experience with many of the great events of the 20th century, a personal account of Iran’s contemporary history and politics, education, along with an eye-witness account of the United States civil rights movement, the women’s rights struggle, other important issues related to psychology and mental health, and personal issues such as surviving cancer in the United States. Her story encompasses shifts in the tempos and melodies of life, along with a leitmotiv of love of family, individual freedom, and unwavering hope for humanity. The book illustrates the personal approach the author has adopted throughout her life in coping with and overcoming every adversity through using the power of education. It’s also a testament to a woman’s ability to balance all the facets of her life–. career demands, family responsibilities, emotional needs, and the quest to help others. 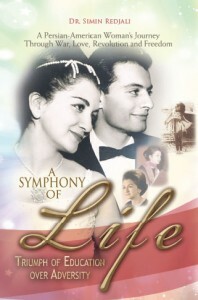 This book with historical pictures uniquely covers the period between the rise and the fall of the Pahlavi dynasty, the rise of the Islamic Republic of Iran, and the author’s personal life in Europe and the United States. It is supported by extensive research, and expresses a great hope that the longstanding cultural misunderstanding and miscommunication between Iran and the West will soon be replaced with a mutual respect which celebrates the power of individual freedom and democracy.